The days are getting colder, the nights are drawing in faster and there's no better time to turn your living room into a cosy palace! 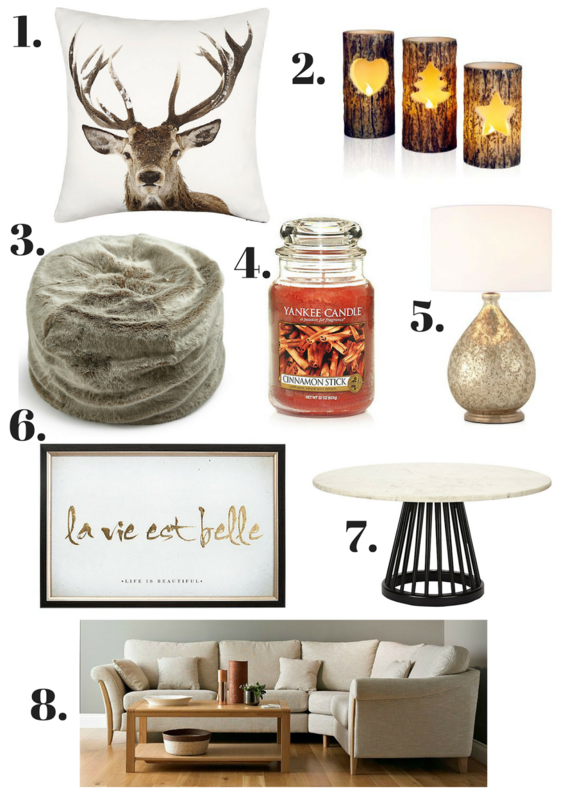 I've put together a mood board to give you some inspiration - what are your favourites? 1. John Lewis Stag Head Cushion - the perfect way to subtly bring a bit of winter and Christmas into your home! 2. 3 Winter Spruce Fragranced LED Candles - nothing makes a room cosier than candles, especially wooden Christmas-themed ones! 3. M&S Faux Fur Bean Bag - anything furry should be welcomed into your home with open arms this winter. 4. Cinnamon Stick Yankee Candle - a cosy room can't be complete without a winter-smelling Yankee Candle. 5. Floral Mercury Glass Table Lamp - table lamps are important when setting the mood in a cosy room and this one is gorgeous! 6. La Vie Est Belle Metallic Framed Print Wall Art - cover bare walls with wall art and pictures to create a cosier environment. 7. Fan Marble Coffee Table - where else are you going to put your hot chocolates and pumpkin spiced lattes?